Born and raised in Croydon, Angel O’Dwyer was referred to us by her school. After joining the Premier League Works programme in the summer of 2015 she quickly showed great focus and determination through her engagement in classroom activities. She emerged as a very strong leader and was able to build strong bonds with other young people and staff alike. A couple of weeks into the programme Angel’s attendance began to drop and she failed to complete the programme despite regular calls from staff to encourage her back. 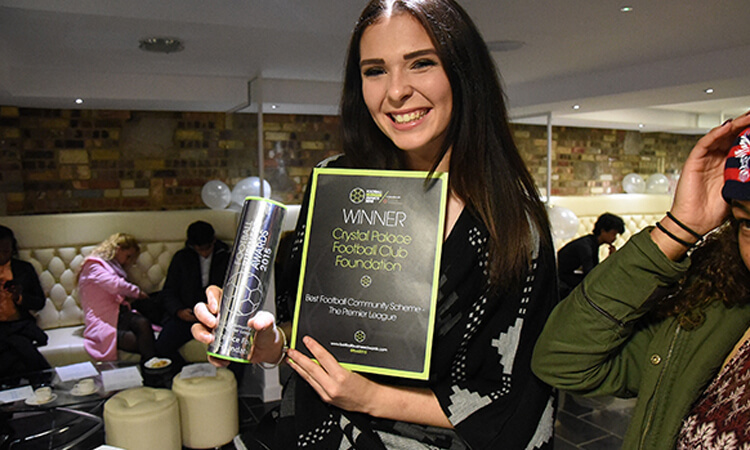 After starting sixth form she joined the Foundation’s Community Eagles Volunteers programme, obtaining her DBS clearance. This enabled us to keep in touch with Angel as she regularly came into the office to volunteer on administrative tasks, assist on the Premier League Enterprise Academy and assist on football coaching sessions. Angel’s offending behaviour had subsided and she began to find her focus so was given a second opportunity to complete the FA level 1 course that she had missed earlier in the year. Struggling with her A Levels, Angel started to become argumentative at her football training sessions, which led to her leaving Palace Ladies U18’s team. Always there to support her, Angel opened up to our staff and we found the root to much of her unhappiness – the death of her sister who was involved in a quad biking accident in Greece. Angel attended the Premier League Works Celebration Ceremony and continued to turn things around by forging ahead with many volunteering opportunities across our programmes. As a result of volunteering on the ASPIRE II Employability programme in April 2016, Angel was given the opportunity to volunteer for two weeks at RDC Espanyol in Barcelona.